JOHANNESBURG — The world’s biggest platinum producer has fired 12,000 workers in South Africa after they engaged in an illegal strike, company officials said Friday. The nation’s main mineworkers' union said it disapproves of the move and will try to negotiate with Anglo American Platinum. Anglo American Platinum said in a statement that it dismissed the workers after they held a wildcat strike for three weeks at its platinum mine in Rustenberg. 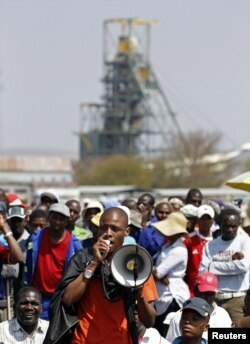 A mineworker addresses his colleagues before taking part in a march outside the Anglo American mine in South Africa's North West Province, September 12, 2012. Workers at that mine, some 100 kilometers from Johannesburg, went on strike for higher pay last month, a few weeks after workers at the Lonmin platinum mine in Marikana started a separate illegal strike. In the end, the Lonmin workers got a substantial pay raise, though the six weeks of violent strikes led to the deaths of at least 44 people. Anglo American said the Rustenberg strike has led to a loss of 39,000 ounces of platinum, or about $80 million (700 million rand) of lost revenue. Several other mining companies have been affected by the stoppage. Anglo American also said it was experiencing what it termed “strike contagion,” with workers at its other operations making similar demands of management. Company spokeswoman Mpumi Sithole said the company urges workers to go through legal channels - such as their unions or the company - to make their demands. “We would like our workers to know that this is illegal industrial action and we’ve got engagement structures that are operational, that are working, that have been working for years, that should they have any problems that they would like to bring to management’s attention, that they use those channels,” said Sithole. National Union of Mineworkers spokesman Lesiba Seshoka said his union represents most of the workers at Anglo American Platinum. He said the union can’t have the workers reinstated because it was an illegal strike, but that the union will try to find a compromise. There is fear that the mass firings could spark further violence. News reports had said that one miner at Anglo American was killed Thursday in violence in Rustenberg. Meanwhile, a high-level commission recently started its inquiry into the dozens of deaths at the Lonmin mine in Marikana.